An anthropologist proposed a game to some children from an African tribe. He placed a basket full of fruits next to a tree and said to the children that the one who will reach the tree first would be the winner of that basket. When he make a sign to the infants for them to run they all took each others hands and ran together after they sat together and shared the prize. When the anthropologist asked the children why they ran in that particular way if just one of them could be the winner, they answered him: UBUNTU, how could one of us be happy if others are unhappy? 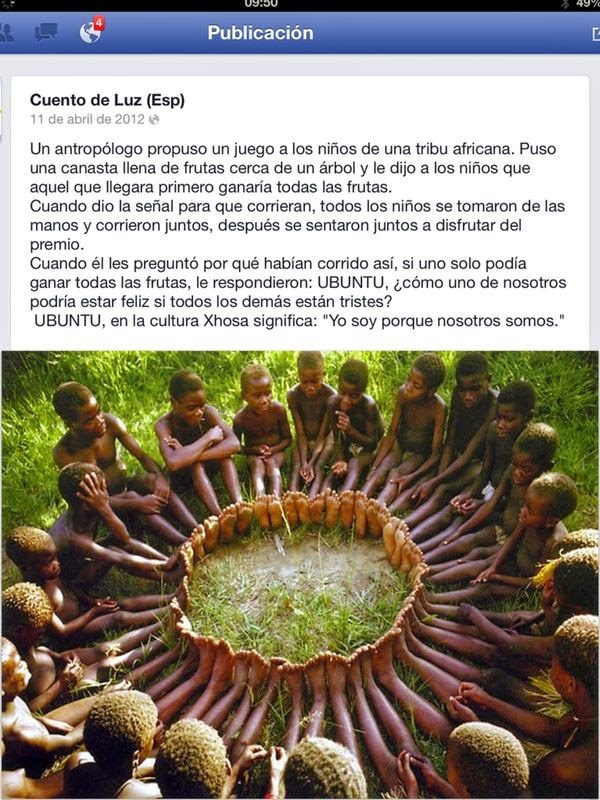 UBUNTU in Xhosa culture means: "I am because we are"
Este relato da mucho que pensar sobre los valores inherentes de muchas culturas como la africana que apelan a la humanidad de todos los seres humanos. En este mundo moderno en el que vivimos en occidente rodeados de mundanal ruido y mensajes consumistas no nos vendría mal aplicar un poco de las enseñanzas de estos pequeños grandes sabios. This tale makes you think about the inherent values of many cultures, such as the African culture, that appeal to the humanity of all the human beings. In this developed western society in which we are living in surrounded by the madding crowd and consumer messages, it would be a good idea to start to practice the teachings of this wise little men.